The America’s Motor City exhibition tells the fascinating stories of both how cars built metro Detroit and how metro Detroit built cars, as well as why Detroit became the Motor City. The exhibit incorporates the museum’s popular Automotive Showplace exhibit at its entrance, where cars from our collection are featured. The area also showcases visitors’ stories of their experiences with their favorite classic cars — complete with vintage photos of individual cars and their owners. The exhibition continues with a brief nod to car culture. Detroit loves cars, and automotive manufacturing in Detroit has resulted in a deep-rooted connection with the automobile. The Detroit International Auto Show and Autorama, shows like the Woodward Dream Cruise and the Concours d’Elegance, and dealership loyalty all are part of Detroit’s car culture. Moreover, Detroit has demonstrated automotive superiority in auto styling, technology, marketing, car use, etc. The exhibit continues by exploring the "Detroit Factor." In the early twentieth century, there were other "motor cities" in the country and around the world, so why did Detroit emerge above the rest? Detroit became the Motor City because of its Industrial leaders and innovators, established industries, access to resources & capital, manufacturing ability and serendipitous relationships. Detroit’s auto industry began in the 1890s with tinkers like Charles Brady King, and dedicated manufacturers like R.E. Olds, the “Schoolmaster” of Detroit’s auto early auto industry. 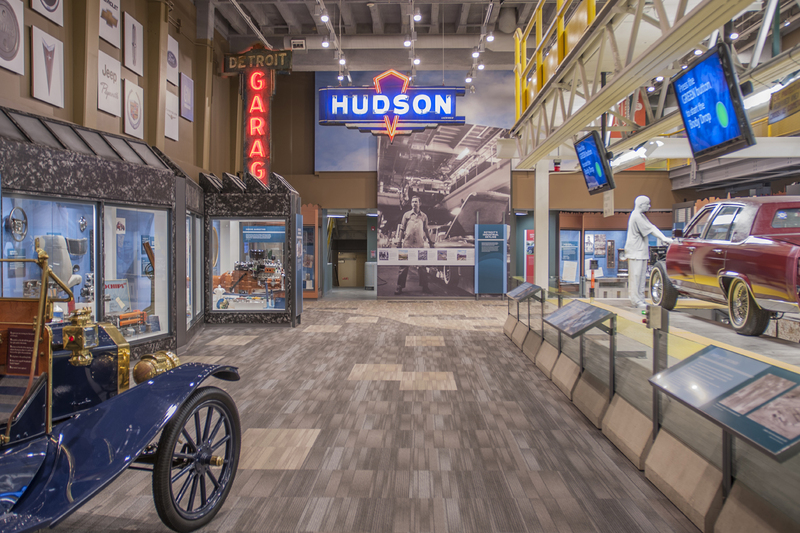 The exhibit continues with stories surrounding how Detroit builds cars, from its early hand-built horseless carriages to the innovation of the moving assembly line. Visitors learn about the Detroit entrepreneurs who came together to cement Detroit as the Motor City, as well as the many different aspects of modern car development, including design and marketing. The popular Cadillac "body drop," taken from the Clark Street assembly plant when it closed in 1987, is the showpiece in this section of the exhibition. Visitors can watch it lower a Cadillac body on to its frame every twelve minutes. The focus then shifts to how cars build Detroit. By the 1910s, an influx of workers from around the world came to Detroit to work in high paying factory jobs. They, along with native Detroiters, organized in unions to fight against unfair labor practices, and the UAW was born. As the 20th century progressed, the shape of the city changed. New neighborhoods sprang up around new factories in outlying communities. A final section returns the focus to Detroit’s car culture, with displays and information on how Detroiters — and Americans in general — view their cars as extensions of their personalities. From bumper stickers to custom paint jobs to elaborate home garages, our cars have become part of our collective American culture.